As artists go into home shopping market, there are advantages of easy purchasing products in great feature with detail instructions…but there also are disadvantages which I can’t mention in detail. Just, I sometimes think disadvantages are larger than advantages. I think it’s not a very good one. Croquis Waterdrop… this one… there was an article featuring its advantages. Is it real? I don’t care it very much... But I have questions about it. It has been called a finish with a high-moisture…so I thought it to be a real watery one. No, actually, I wanted to check it myself. I don’t trust cosmetics from home shopping at all. Posting at this point… I don’t remember when I did it. Anyway, I’ll tell you about the color before I mention the word stickiness, covering, sustainability. I selected light beige for normal skin. Is it a foundation for shading? Its color is more shocking than the color of Benefit Gorgeous. Hmm, but it’s watery…. Well, damp might be a more correct word. So, in my point of view, it’s damp due to the oil. So I won’t recommend it to people with oily skin. I don’t want to say anything else. I just wanted to mention its expensive price. I’ve been recognizing cosmetics from home shopping as bargain sale… but the prices are soaring these days. Of course the quality has been upgraded. What is a problem is that the rising rate of the price surpasses the upgrading rate of quality. It’s the producers’ selfishness, who think the customers sitting ducks. There are some friends who have been using this for 3~5 years. They stick to cream foundation for their reasons. Some may are satisfied with it very much, but others say there’s buy this because there’s nothing better than this. So, whatever the reason… it has a attraction makes people to choose. As time goes, various compact foundation have been released…and the average quality of the products soared incredibly. They supplemented the flaws of Mac Studio Tech Foundation. Frankly, my friends don’t use it anymore. But that I recommended Chanel compact foundation has some responsibility for this in some point. As they are not thoughtless followers, it should be their choice. Then what made they use other products? Most people made a positive assessment to Mac Studio Tech. But all said “I’m tired of this.” What made them tired of this? Watery foundation is good for dry skin but not for oily skin as this gives oil not only moisture. But Mac Studio Tech Foundation is a bit different. First, it covers very well. The covering get better when applied on part needs light applying. It’s good for people who were disappointed watery foundation with not enough skin-penetration. The stickiness is also good and it has little darkening as a Mac foundation. It’s composed of moisture particle and powder substance. But flaw is in an unexpectedly the case. Like Benefit Gorgeous it has sponge at the bottom as it is a compact-typed cream foundation. So it causes an unexpected accident because of this environmentally great case. Mac Studio Tech is a watery product. The foundation is wrapped in foil. You may it’s considerate of Mac or it’s excessive to do so. To my cynical view, I don’t get the point of why they use foil. Does it mean is not sustainable without a foil? Is that because of possibility of moisture loss? I can see the water drops when I unwrap the foil. It may be felt like an extremely watery product, but I don’t think so. It will dry away soon. When I used it for first time, I was surprised by its moisture. But it starts to get weird as time goes. 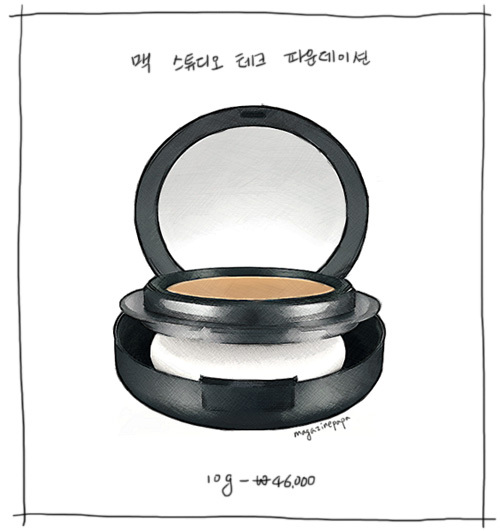 It means this moisture foundation become a powdery matt foundation. As time goes, the watery feeling goes away. because salespeople emphasize on not unwrapping completely. It should be used carefully. I don’t think we should use this with that effort. They also advice to spray mist on it when it fills like dry. I think it’s better to use domestic products which cost half the price. I think it’s better to request a case upgrading. Their problem solving method is disappointing. So in my point of view, the Korean brunch has no intend of upgrading. “It’s generation where one who has great problem solving ability succeeds” said my sister. Considering that, 21century for Mac is awful. As a user who loves Mac’s eyeshadow, blusher and strobe cream, I feel sorry for them. Ah~ do you think it’s a Philadelphia cream cheese? I eat this without unwrapping the foil. Keeping it with foil looks uncomfortable to me. But it’s ok as it’s a food. I’m worried about foundations be labeled ‘keep it refrigerated at 2~10 degrees Celsius. Since I got the present, I used it with foil half-opened. The product can be kept in original condition only by with way. So… by now… It’s a solution to keep the foil. In addition, You shoul be careful about the temperature difference between inside and outside. In this condition, keeping the foil can’t prevent the product from drying. So, this has a limitation in keeping the condition. It’s what this product is. Look at Benefit Gorgeous, the product is on the upside but it doesn’t dry away. but it has technical flaw of evaporating. In conclusion, get a case from Lock And Lock..(?). If Mac cares the customers, they should make light and transparent rubber packer, not this dangling foil! Human is made to think and give efforts to invent things when he needs something. So Mac, why don’t you give some efforts? One active manager who noticed the necessity of change. The complain about moisture was long. Let’s look at the sponge. Mac calls it a special sponge, but it’s nothing but a durable sponge. It gets stain when washed as other sponges. I don’t feel better applying effect from it. Sponge from E-mart also applies well. Requests for sponge were so much that I almost finished the posting. The posting will be held after few thousand years later. The finishing touch in a condition moisture sustains is not matt but it’s not sticky and little powdery with not that dry feeling. It is watery right after applying it, but skin surface gets doft in no time. But it is disappointing in that it doesn’t have fine particles stays on wrinkles on face despite of the high price. There are 20 colors in USA. Mac and Bobby Brown has variety of colors, but Asians need careful choice as they have yellow-toned skin. Some attractive colors may the skin look more yellowish or make white color look natural than gorgeous. So it is good color for the skin of staffs at Mac store. But, it doesn’t goes well with pale or yellowish skin. If those people are to purchase at department stores, they need to test products of Shu Uemura, Shiseido, Luna Sol. Domestic products can be perfect to your skin, may be. I used Studio Tech NC15, which is known as the brightest one in Korea... it gives natural feeling rather than bright feeling. I don’t have much complains about this, I sometimes like to express natural looks. NC20 may fit best to general skin tone. The problem is… like I said before… natural and healthy rather than gorgeous? Some may feel dull. It’s close to Asian foundation like Shu Uemura rather than American foundation like Bobby Brown. You must test it before purchasing. Oh, Mac Studio Tech testing must be focused on color test, because it’s not meaningful except color checking to actually visit Mac store. As Mac store has all the products unwrapped, they are dry already. So, you can’t test the product perfectly. So you may be disappointed. You might have questions. What to do after the product dries? No. Only, the feeling of light applying is gone and it floats or crumples easily. If you have the skill to take care of it, you can use it as a new type of foundation. Dried Studio Tech is just a matt foundation. Moisture shrinks and oil is not felt… It’s perfectly matt in some way. If you stray mist like Mac says, it can be nothing. In my case, I applied it on scars after lightly applying liquid and it was useful. it’s a good product if you can stand its price and the efforts needed to take care of it. But it’s not recommendable if you can’t stand this annoying care. If you cannot but take the foil off, it is of no use for them. One more thing, given that you use it up totally, the moisture goes away totally, and it becomes rough like foundation particle bales. Like all my friends and me who treats sponge carefully feel, it feels somewhat dirty. Why I’m telling you this…is because 0.5% of my friends though it dirty. Did you guys saw the movie <Inception>? I enjoyed it very much…. Music of Edith Piaf’s song which alarms ‘kick’ attracted me. I respect some directors…this movie of Christopher Nolan made me deeply consider about his depth. One chairman of a movie industry said there’s a guy who saw it nine times…so I saw this carefully. My head went dizzy after the movie. The G.P.A was fairly high… I don’t think it’s not the best movie of Nolan. Just, it was special to me because it reminded me of reading <interpretation of dream> which I liked most. But for ones who dreams too much or dreams lucid dreams often must see this movie. It may confirm what you’ve been thinking. Especially kick!! After that, I’m getting into my dream I have ignored for long. I usually don’t see movies or books twice, but I want to see it once again. but if you are not confident to understand it… It would be better to see only the movie. Anyway, aren’t compact foundations so many? They’re what I picked out…but there’s more.